OPTIBELT RB ribbed/ micro v-belts are precision engineered for superior performance and manufactured for incredible durability. A wide range of constructions are available for industrial, automotive applications, serpentine belts, alternator belts and more. "OIL RESISTANT: Engineered rubber compounds and bonded fabric top layer gives added protection. TEMPERATURE RESISTANT: Increased capability to operate under conditions that make other belts brittle and crack, which saves costly replacement repairs. 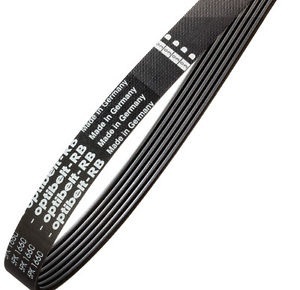 LOW NOISE: Engineered rubber compounds and constructions make OPTIBELT ribbed belts some of the quietest and smoothest running belts available. VERSATILE: Flex range that can accomodate difficult idler stresses and serpentine applications. "